What is the French Press Method? 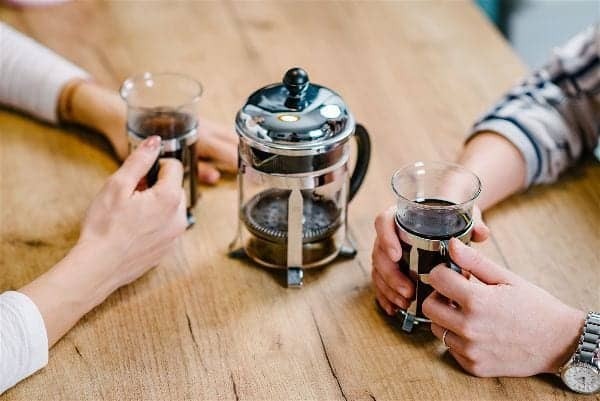 Why Pick the French Press Method? Espresso is a favorite coffee drink of many: The aroma is almost addictive. But unless you have your own espresso machine, it’s usually consumed in a coffee shop. Why do we limit ourselves? Your secret tool for making an espresso could be in your kitchen already: a French Press. Keep reading and let’s go in the details of each one. Here’s how many coffee lovers get the most from their favorite grounds in a simple manner. 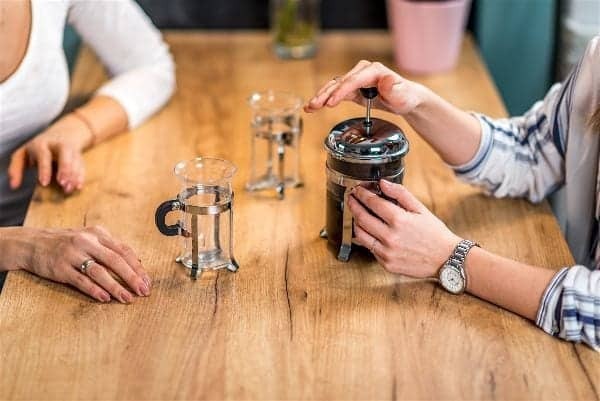 All it requires is a glass—or sometimes aluminium—jug with a mesh filter and plunger that firmly fits inside and can be pushed down. You can let your coffee brew for a while and then push down the grounds and pour yourself a cup. So you can see no process is perfect. Why should you consider it for your next espresso? The French Press method is loved because it enables almost anyone to make good cups of coffee—and yes, espresso too. French Press are found in almost any major store and they’re less expensive than state of the art machines. And if you practice enough they can deliver the same quality of coffee as high end coffee makers. They’re also ideal for households since you can make two or three cups at a time. This makes for less wastage of coffee compared to large machines. Often too much coffee is made and you have to throw the cold liquid out at the end of the day. Ready to try your hand at this new technique? Realize that espresso is slightly different than coffee. It’s usually made by pushing steam through grounds. That’s how you get the unique flavor. Therefore the water temperature used in the French Press is of utmost importance. 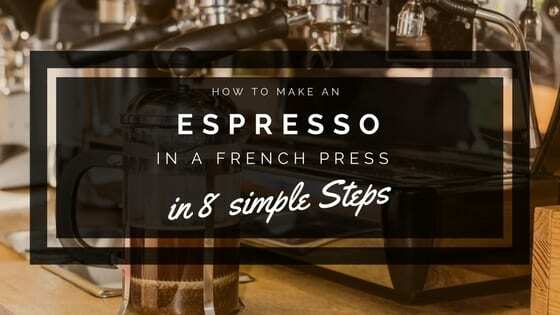 This and other steps you’ll find below should be followed meticulously if you want a high quality espresso brew. So let’s start with good preparation. Wasting time looking for a utensil at a crucial moment when you need to watch your brew, can result in a disaster. You don’t want your espresso to be bitter because your attention wavered. You need to grind your coffee fine because that allows more flavor to be extracted when the particles meet up with the hot water. 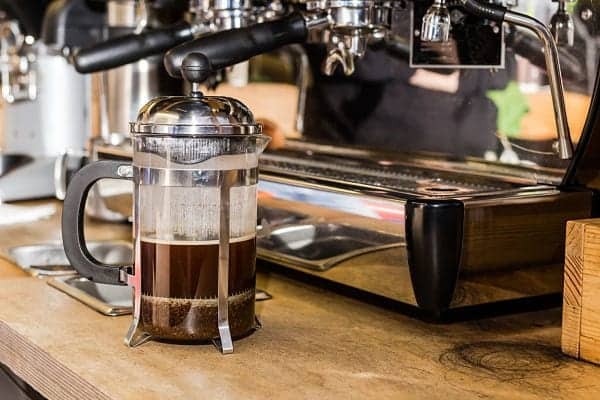 However, the unique design of the French Press — different from espresso machines — means these fine particles may travel through the filter. Be prepared to do a few trial brews — with different grounds — until you get the perfect size that optimizes flavor but stays put under the filter. It’s therefore ideal to have a top of the range coffee grinder so you can make small adjustments. The French Press doesn’t heat water up automatically like coffee makers do, so you need to boil water in a kettle first. Now you need to find the perfect amount of coffee grounds to put in. With the plunger still removed, throw the grounds into the press. Handy Tip if you’re using normal coffee grounds: Espresso tastes much stronger than coffee, so simply double the amount you’ll use in the press for an ordinary cup of coffee. Now here is where technique plays a role. You want to get the most flavor from your coffee grounds. This you’ll get if you let your grounds bloom. This is done by adding only some—about ¼–of the water to cover the grounds so they’re properly moistened but not soaked. These oils contain the flavors you love so much and when those gasses escape, your brew tastes smoother. The reason why expresso is strong, but not necessarily bitter is because the brewing processes extract all these oils optimally. And now you know how to do it with a French Press. This process only takes about 30 seconds, so don’t wait too long before the next step. Now you can pour in the rest of your water. The ideal temperature of the water you pour in should be 195°F (90°C). If you used a kettle to boil the water, just wait half a minute before pouring in the water. Meticulous measurement is needed here. You need a cup of water for every 20g of grounds you placed inside. When you do this accurately — and keep notes of your different brews — it also makes it easier to customize your upcoming brews to suit your taste. Now you need to give your brew time to work. Give it a quick stir with your spoon or whisk so you know the grounds don’t stick together. You want the flavor of each surface to be exposed to the moisture. That’s how you get out more of the flavor. Now place the plunger into the press, without pushing the filter down yet. Sealing the press means you won’t lose much heat during the steeping process. Remember, temperature is essential when it comes to espresso making, because it’s the high temperatures that help extract flavors. Steeping takes anything from one to four minutes. In contrast, a short steeping time will result in bland, sour coffee. Enjoy experimenting to find the perfect balance. Tip: Remember espresso isn’t supposed to be bitter. This drink is all about flavor. Unfortunately the one risk with making espresso in a French Press is that it could result in bitterness. This happens when your steeping process is too long. The strength of coffee relates to the acidity level of the brew and it only tastes well up to a certain point. After steeping you need to get rid of those grounds so you can enjoy your brew. Push down on the plunger gently and push it down towards the bottom of the press. Here’s where you’ll discover if your grounds are too fine. 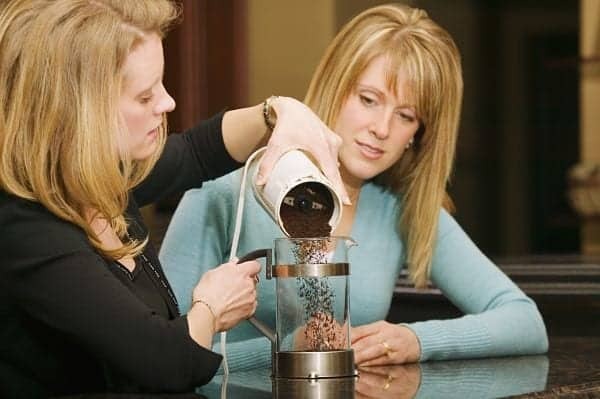 If you see too many particles left over in your brew, better grind the beans differently next time. A few may not matter, but you don’t want a grainy drink. Remember, there is pressure inside the chamber and you don’t want the glass to shatter or the components to get damaged. A great tip to get the cream you love: You probably love the crema on top of a professionally made espresso. You can create that too via some fancy techniques with your plunger. Simply pump the plunger by moving it halfway down and pulling it back up again. A few times will be enough to create the crema so adored by coffee aficionados. Note that crema is usually a sign of quality coffee. This starts with the beans you use, so if you want that layer of foam on top, you’ll have to invest in exceptional beans. This step is not simply an after thought. It’s imperative you pour the brew out — into your cups or another container — as soon as you’ve pressed down the plunger. If you leave the espresso inside you run the risk of it becoming bitter, as it will still be in contact with the grounds laying beneath the filter. Quickly decant the liquid and enjoy. After all, there’s nothing as thrilling as a fresh, hot cup of espresso, right? Handy Pouring Tip: There’s a chance coffee particles will be left in the brew. Place a cloth over the press when you pour it out to prevent these from getting into your cup. DO NOT use paper filters for this step, because they can actually change the taste and texture of the espresso you just made. Let’s be honest. All our palates differ. So why not consider one of these options? The market is filled with flavorings designed for coffee. Perhaps a caramel or hazelnut aroma will enhance your brew. These flavorings are sold as liquids and can be added during or after the brewing process. Not everyone drinks espresso without milk. Though black is the customary manner, you can add a final touch with some froth if that’s how you like it. And you don’t need a fancy machine for that either. If you want to enjoy your drink at a high temperature, do your frothing while you wait for the espresso to steep. If you’re in the mood for a cappuccino, simply use the espresso coffee you just made with more of the milk you frothed. Yes, with a French Press you can make almost any delicious coffee drink now. Get this right and the brew you’ll pour out of the French Press may taste just as good as the one you got at your favorite coffee shop. 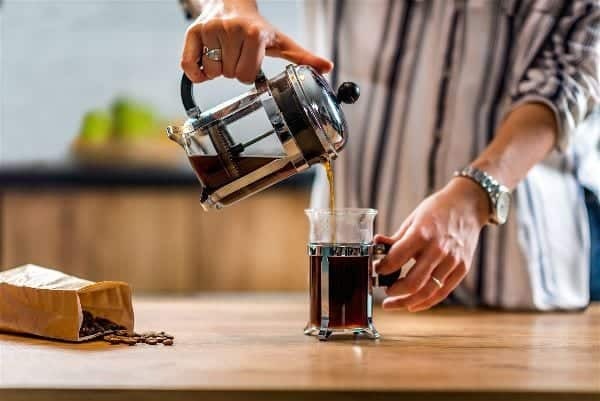 If what you love about espressos are the aromas and the strength of the brew, it’s possible to get it right with your press, because that’s exactly what a French Press is designed to do. And best of all is you can now customize your espressos to suit your particular taste. Ready to spoil your friends when they come over next time? Or perhaps you’ve found more dynamic solutions of how to make espresso without a machine. Share your insight with the rest of us by leaving your feedback in the comment section. Previous Post Your Coffee Crash Course: Be in the Know Next Post How Long Does Coffee Keep You Awake?